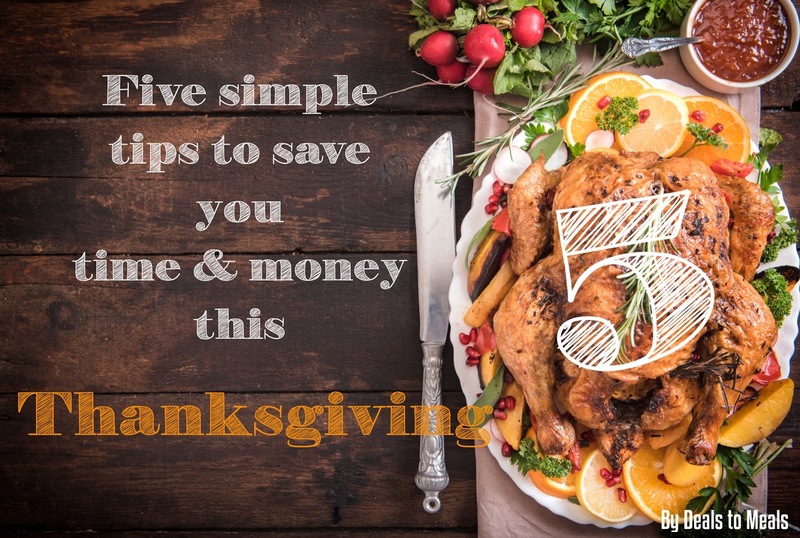 5 Simple Tips to Save You Time and Money this Thanksgiving! The holidays are in full swing and all of us are looking for ways to save a little money and keep from pulling our hair out from unwanted stress. 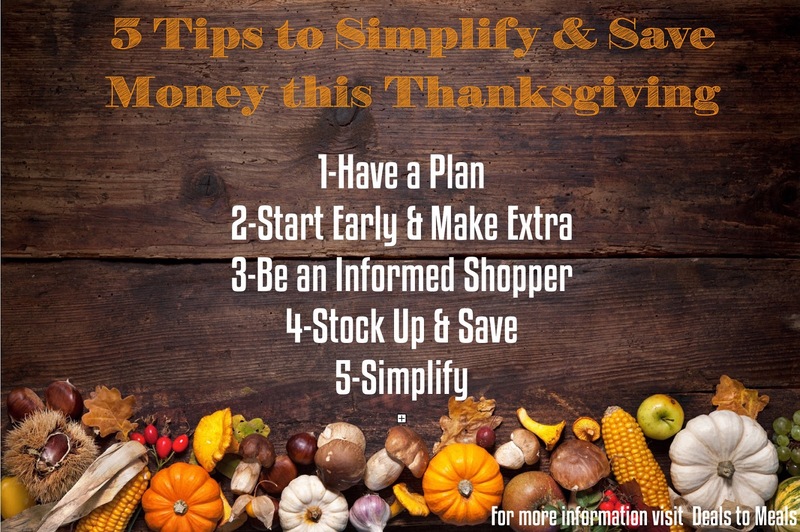 I am excited to share a few of my favorite time and money saving tips to help you during this Thanksgiving holiday. First and foremost, have a plan! If you are able, start planning your Thanksgiving meal at least a week (or more) before the holiday begins. Have a quick list of what items you would like to make, who will be making each recipe, and have a game plan for the busy day. There are lots of different components to planning a Thanksgiving meal, so think through the different aspects to the meal (and day) and put it on paper. Everything from decorations, shopping, food prep, cleaning can all be organized and put to a schedule to help the day go more smoothly. Our free Thanksgiving Menu Sheet is a great way to stay organized. We upload this as a Google document so family members can all add to the document and decide what they would like to help with. Want help with your menu plan as well? 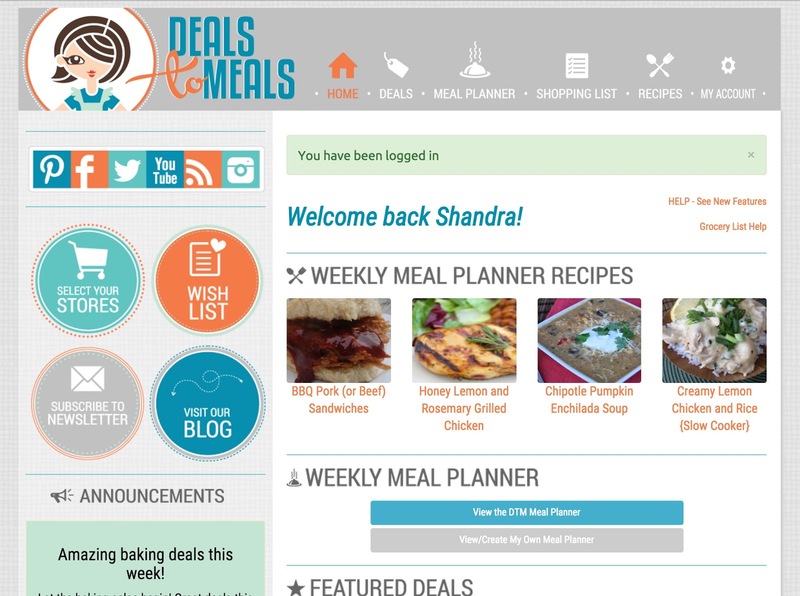 Deals to Meals is here to help simplify your life! On November 18th we will give all Deals to Meals members a detailed Menu Plan and Grocery List to help make your meal planning easy and fun! Members of Deals to Meals also have access to all of our tried and true recipes we know your family will love. Once you have a plan, it’s time to start thinking about ways you can relieve stress the day of your party, by doing things ahead of time. Many Thanksgiving recipes can be made a week, or several days before, and frozen for later. Here are some of my favorite recipes that work well with this method. 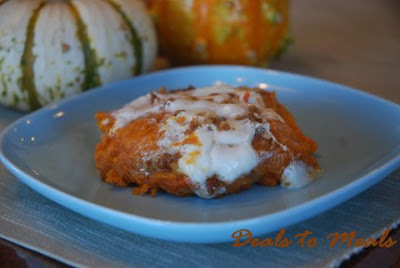 *Sweet Potato Casserole freezes beautifully and can be baked an hour before serving (thaw in the fridge the night before). *Homemade Cranberry Sauce can also be made several days in advance and either frozen or kept in the fridge. *Homemade Pie Crusts are another great recipe that can made, rolled out into pie shells, and frozen until ready to bake (or of course, you can use store bought if you wish). *Mashed Potatoes can also be frozen ahead of time. Make them as usual, let them cool, and then freeze in a large tupperware or Ziploc bag. Before serving, thaw the potatoes in the fridge the night before. When you are ready to reheat the potatoes, place them in a crock pot to heat slowly. Add some more heavy whipping cream and butter to help soften the potatoes and whip them with an electric mixer once they are warmed through. *Turkey: if you are using a turkey breast, you can crock pot the turkey, shred the breast meat and freeze until the day of the dinner. When ready to reheat the turkey, you can place into a crock pot and warm on low heat for 3-4 hours, or until ready to serve. Add some chicken broth to keep the turkey nice and moist before serving. *Homemade rolls are so fun to make ahead and have in your freezer (I use this method all year–no more Rhodes in our freezer!) Make the dough recipe as normal, put the rolls on a greased cookie sheet and then wrap with saran wrap. Put the rolls in the freezer as soon as you have them rolled out (you don’t want them to begin to rise). The morning of Thanksgiving, pull the frozen rolls out of the freezer and place in a warm spot of your home. Let the rolls rise on the counter on a pan (about 2-3 hours) and when they have doubled in size, bake them as usual until they are golden brown. 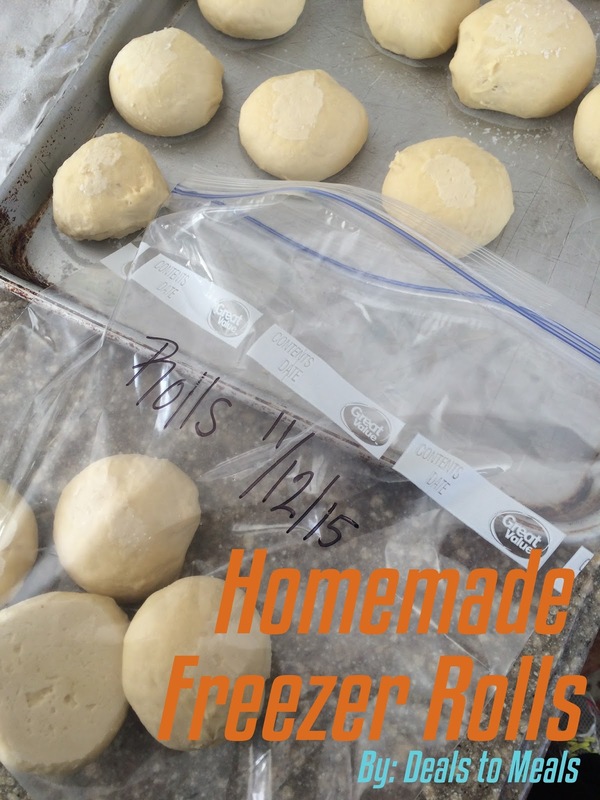 If you want to have these rolls on hand for other recipes, just put the frozen balls of dough into a Ziploc bag and keep in the freezer until ready to use. These work great for monkey bread, calzone dough, etc. Another tip is to double your holiday recipes so you have plenty of leftovers you can enjoy the following week, or freeze the extras for later. For example, my family loves sweet potatoes all year but yams are rarely on sale besides in November. I always make 3-4 pans of the sweet potato casserole and then freeze several of them for later. Keep freezer tins/pans on hand to make freezing the recipes easier. We also love having cooked meat in our freezer for quick meals on busy nights. So, while I am cooking one turkey breast, I always throw in a second so I know I have lots of leftovers and turkey for another meal. You can do this same thing if you are cooking a ham, pork roast, beef roast, etc. Being an informed shopper will save you BIG money this week. Most families will spend an average of $50-$100 on this one meal, so it’s important you know what you are buying and where to get the best deals. Some of the year’s BEST grocery deals are on this week. Nearly everything you need for your holiday meals will be on sale. Whether you are looking for turkey, canned pumpkin, frozen pies, stuffing mix, soda pop, potatoes, yams, etc., it is ALL on sale this week. 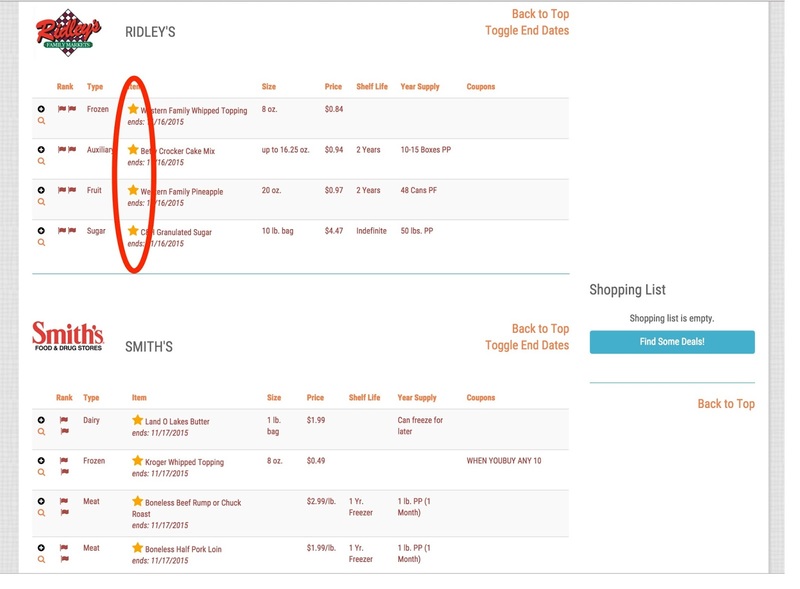 Deals to Meals will tell you where all of the best grocery deals are in your area. We compare all of the grocery store prices to Costco and Walmart and tell you when items go on sale for great deals (without having to use coupons). Just login to our website, click on the stores you want to shop at, and you’re set to save! There are over 25 grocery items everyone should be stocking up on this week. If you miss the chance to stock up on these items, many of them won’t be go on sale again for another 365 days! That’s a long time to wait for a another sale–especially if it’s items your family uses on a regular basis. So, save yourself from having to buy these items at full price throughout the year and stock up this week! 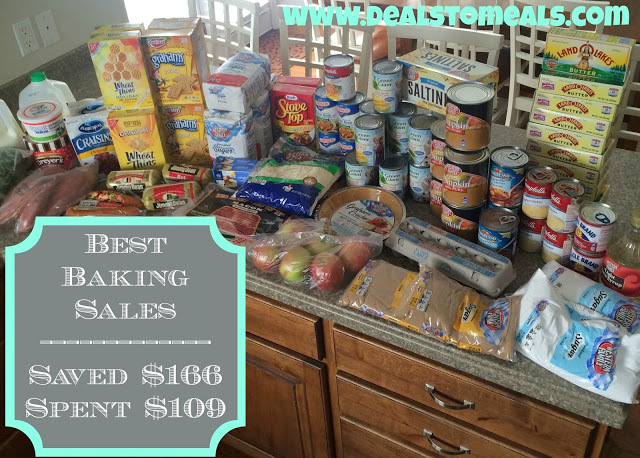 I went shopping last week and spent $109 on many of the Thanksgiving deals I wanted to stock up on and saved $166! That’s nearly 60% off Walmart’s regular low prices. How cool is that? 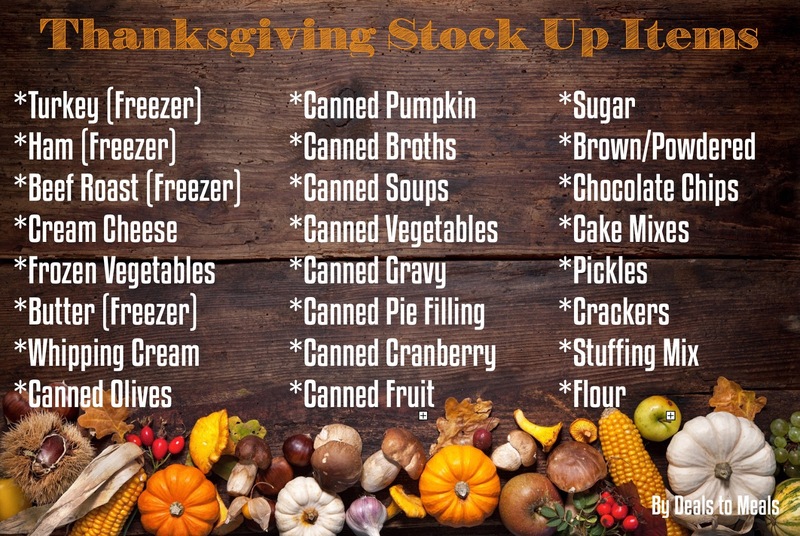 Tip: don’t just buy the items you need for the one holiday meal, stock up and buy several to put in your pantry or food storage for a later time. Check the list below to see which items you might want to stock up on. Visit Deals to Meals for a detailed list of where all of these grocery items are on sale. Focusing each week on the gold starred items (meaning they are LESS than Walmart and Costco), will save you the most money (up to 70% off)! *Use paper products instead of fine China. If you are less formal, this is an easy way to save you hours of doing dishes. *Let people help you. Don’t try to put the entire meal together on your own. *Keep your menu simple. Stick to only those recipes your family loves and cut out any extra recipes that don’t seem to be people’s favorites. *Cook a turkey breast instead of a whole turkey. Turkey breasts can be cooked in a crock pot and are much easier to carve and bake. Here’s our favorite turkey recipe. *Remember the real meaning and purpose behind the holiday season. It’s not a time to be stressed and run around unable to enjoy the holiday. Keep your focus on family and relishing the moments we have together. *Keep your meal plan simple, do a lot ahead of time, watch for the best deals, stock up when items are on sale, and you will be set for the greatest holiday season ever! Here at Deals to Meals, and One Good Thing By Jillee, we wish you a most delightful (and delicious) Thanksgiving season. FIVE Items you need in your food storage!